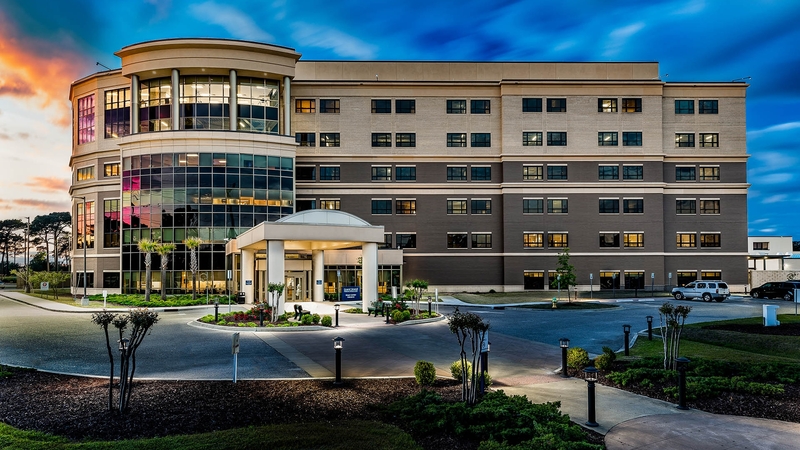 TMP has proudly completed several projects at Grand Strand Medical Center over the span of two decades including an expansion & renovation of the emergency department. In 2008 TMP master planned a location for a new patient tower in 2008 that completed construction in 2011. The original 3 story tower included Cath Labs, CVICU and a CV Step Down Unit. The tower was designed to expand vertically an additional 3 floors, In 2014 the 3rd floor shell space was built out and included pediatric intensive care beds. The 4th floor shell space vertical expansion was also added in 2014. In 2015, the 5th and 6th floors were added along with a new central energy plant. The 4th floor was also built out with additional medical/surgical beds. In 2016, TMP designed an 11,000 sf addition to the existing hospital to establish radiation therapy services for Grand Strand Medical Center. The project was completed in 2017 and included new linear accelerator equipment, exam rooms and other support spaces. The addition is designed to add another linear accelerator in the future adjacent to the recently constructed vault.